The US Department of Homeland Security released a tool on Monday to detect whether a computer is infected by the Conficker worm. If a user is unable to reach any of these websites, it MAY [my emphasis] indicate a Conficker/Downadup infection. The most recent variant of Conficker/Downadup interferes with queries for these sites, preventing a user from visiting them. If a Conficker/Downadup infection is suspected, the system or computer should be removed from the network or unplugged from the Internet – in the case for home users. So if you can, or cannot surf to those web sites you may, or may not have Conflicker. So in other words you still not going to have any idea! As I keep saying, the bad guys are winning. The Symantec site does have a nice video from 60 minutes in the US about Conflicker. It is well worth watching because it again highlights how the bad guys are beating the good guys hands down. In the video you’ll get an understanding of how much information the virus captures about your PC sessions (basically everything – browsing, keystrokes, passwords and so on). You’ll also see how CBS (the makers of 60 Minutes thought they were safe as it turned out they weren’t. Even worse, they still can’t be 100% sure they are clean because Conflicker could simply be lurking somewhere ready to re-infect. Again, bad guys win. Interesting to see what tomorrow does bring. At last, finally a decent Microsoft ad! Strangely enough it points out the bleeding obvious (that Mac’s are more expensive than PC’s) but maybe that’s what Microsoft need to do more of. Sure it is controversial, but hey that’s the best way to get people to listen isn’t it? I am utterly amazed at how ignorant most people are of the fact that all their wonderful technology can provide excellent information of exactly who you are and what you are doing at any time. In this story “Digital dabs: how Einfeld was tracked with a mobile, credit card and e-tag” it shows how the police used digital evidence like that from electronic tolls, mobile phone and credit cards to prove the guilt of Marcus Einfeld. It goes to show that convenience has a price and that price is usually reduced privacy. In many respects the lust for technology has made the job of tracking individuals much easier than it ever used to be. Stop and think about every email you send, every internet search you do, every login to Facebook, and so on – they’re all trackable. The more you use technology the more ‘digital evidence’ begins to stack up against you. The unfortunate thing about this is that digital evidence is firstly much easier to store and secondly much easier to search. As I have lamented here before, so many people have no concept of the value of their privacy and are surrendering it without a second thought. We happily proclaim the wonders of technology but we seem to remain oblivious to dangers it also brings. Read the story and then stop and think how much information are you giving away about yourself without even thinking? We perhaps wrongly believe that technology has given us greater freedom, mobility and convenience and yet the reality may be that it has enslaved us as never before. 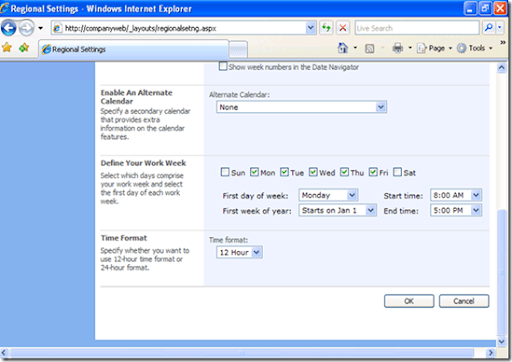 In a previous blog post about Windows SharePoint Services databases I spoke about what SQL technology was used to hold Windows SharePoint Services content and configuration information. In this post I’ll have a look at these databases in action. If you click on the database name (in this case ShareWebDb) it will bring up further information about the database. As you can see from the above screen shot it is also possible to add additional databases from this window. 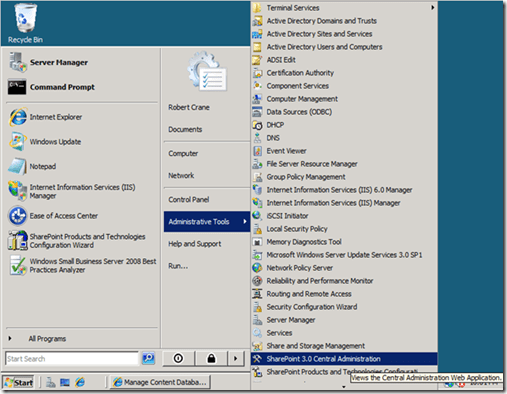 Another important fact to remember about SharePoint is that you not only have GUI tools like what is shown here but you also have similar tools that can be run from the command line, allowing for scripting if necessary. 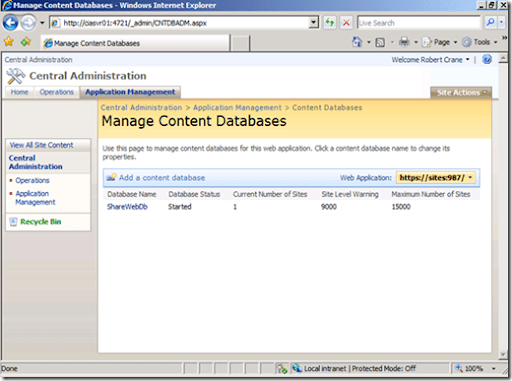 In terms of the file system, where exactly is the SharePoint content database stored? It is stored wherever the default data directory is for the SQL instance that you installed on your machine. 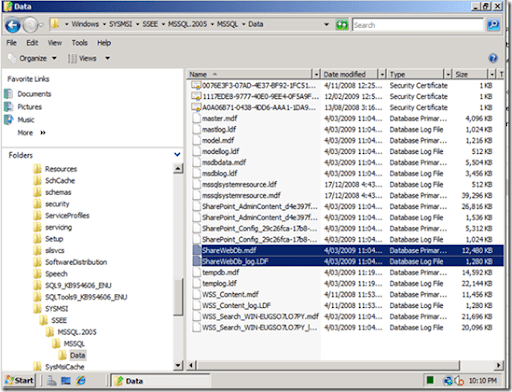 In this case because we are examining Companyweb on SBS2008, which is using SQL 2005 Embedded Edition you will find those files in C:\windows\sysmsi\ssee\msql.2005\mssql\data like shown below. Remember that for each SQL database there are normally two associated files, a .MDF (data) and .LDF (index). Both of these files are important for correct database operations. The actual file size of these database files will grow as the information in your SharePoint site increases, to as large as allowed by your version of SQL server or hardware. 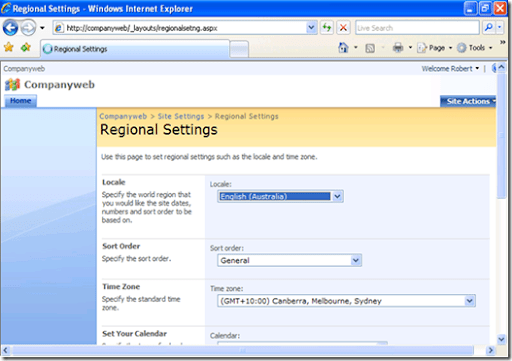 In this case, because Companyweb on SBS2008 uses SQL 2005 Embedded Edition it can grow by as much free disk space as there is available on the drive. Note that you can relocate these databases to other locations if required, which is something the SBS 2008 wizards automate for you. 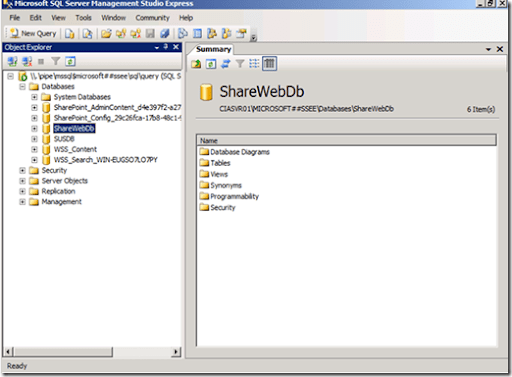 Now simply locate the database (SharedWebDB) under the databases folder and right mouse click to view the properties. 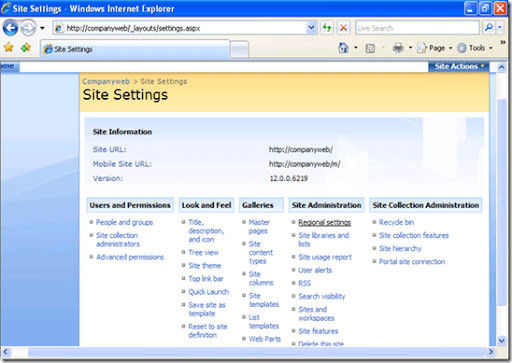 More detailed information about Windows SharePoint Services databases and Windows SharePoint in general is located in my Windows SharePoint Operations Guide. A couple of posts ago I wrote about Facebook follies and the fact that some scammers were using Facebook as way to attract potential victims. Part of this involved a picture of a man standing next to a bright red sports car. In fact it turns out these pictures are taken from someone’s online photo album as detailed in “Facebook scam: Ferrari man’s true identity revealed”. with a lovely photo of ‘Tom’ and the pitch about how much money I can make if I just sign up now. So where’s the protection for the Facebook user? It certainly doesn’t appear that there is much. I always used to say that the stock market was the perfect vehicle for transferring wealth from the stupid to the intelligent but now I’m going to have to revise that to being the Internet. The continuation of these sort of ads again confirm my belief that we are losing the battle against the bad guys. Some may say that what is happening here is not against any law, and that people should always be aware when purchasing ANYTHING from the Internet and I agree. However, the reason that our systems are constantly under threat from viruses and trojans is that most Internet users are totally unaware of how they should be protecting themselves and look at the global problems that has caused. It seems that when it comes to using the Internet, common sense goes right out the window. Now scams like this are nothing new and they happen on other sites like Ebay and what not but it seems to me that technology is making this easier in so many ways. Every day technology makes it both easier to perpetrate crime and confuse the average user. It amazes me in this so called world of ‘Web 2.0’ interconnectivity that most people are being left to fend for themselves in a pool of sharks. The more connected we think we are the more isolated we become perhaps? The moral is clearly, every person for themselves and if it seems too good to be true then generally it is. 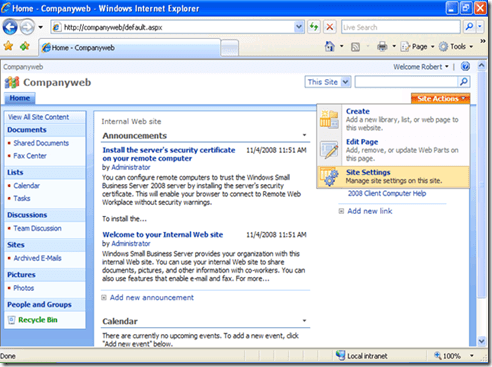 Microsoft has release Internet Explorer 8. Does it really matter anymore? Are many non-techie people actually going to download it? It has some improved features, especially around security but is it really a must have any more? Unless there are some killer features most people are probably going to stick with Internet Explorer 7, until they get a new PC. Microsoft also has a pretty lame set of videos on its Internet Explorer 8 site. These are no where as good as the propaganda that Apple turns out with its ads. The difference to me really goes to heart of the problem at the moment with Microsoft, they just aren’t in tune with the market and the most likely reason is that they are trying to be everything to everyone. I suppose that is part of become a ‘middle-aged’ company. It would be much better if Microsoft stuck to a core range of products but they need to squeeze revenue out so it is easier to do this across multiple markets. So in some sense the strategy makes sense. It would make more sense if they wanted to be more like Apple to get a new advertising company because this latest video and the Seinfeld video haven’t received a very good reception at all, with which I agree. In all honesty I don’t use Internet Explorer all that much these days as Firefox, for me, is just better. In all honestly, I think people simply use the browser that comes with their computer. If is Internet Explorer, they used that. If it was Firefox they’d use that and so on. Most people want to get access to the Internet and don’t really care how that happens. So another version of an Internet browser is going to get a decidedly ‘Yawn’ reception in my books.